ABRAHAM LINCOLN’S BANKRUPTCY | Jeffrey B. Irby, P.C. 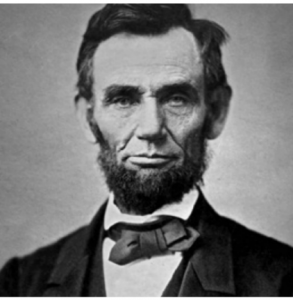 Abraham Lincoln is best known for ending slaveryin the United States, but what you might not knowis that prior to becoming the sixteenth President of the United States in 1861, he was co-owner of a general store. In the early 1830s, Lincoln and his partner purchased inventory for their store on credit, only to see dismal sales in return. When Lincoln’s partner died, Lincoln became liable for $1,000 in back payments, which is today’s equivalent of about $25,000. Abraham Lincoln declared bankruptcy in 1833. In those days, bankruptcy protection laws were not as strong as they are today, so Lincoln was required to surrender his only assets: a horse and some surveying gear. Beyond that, he was required to repay his creditors for the next seventeen years, a condition that would not exist under today’s bankruptcy laws. Yet, we do not remember Lincoln for his financial failure. We remember him for paving the way to abolish slavery, for leading the United States through the Civil War, for helping preserve the Union, and for a 271-word speech delivered in Pennsylvania a little more than four months after Union armies defeated the Confederacy at the Battle of Gettysburg. Here is what we can learn from President Lincoln’s bankruptcy: Your bankruptcy is only one part of your life, and it is a crisis only if you allow it to be. What you do after your bankruptcy is far, far more important than the facts of your bankruptcy. You can decide to allow your bankruptcy to de ne you, or you can decide to use it as an opportunity to live a full life. Abraham Lincoln chose the latter. Nearly thirty years after declaring bankruptcy, he became President of the United States of America. His bankruptcy was a mere drop in the bucket.